Within the first year of starting Nearpod, we had teachers coming out of the woodwork to help us build and improve our product – providing in-depth feedback, volunteering to help edit lessons, promoting best practices on their blogs, introducing us to other teachers in their school, and more. These teacher requests were invaluable, and we believed there was more untapped value for both the professional growth of these educators and the growth of our company. So, we identified our most engaged, dynamic users and invited them to join our PioNear program. If you want to develop amazing tools for the classroom, you need to work closely with and listen to teachers. Ambassador programs create a formal channel between product teams and end users. At Nearpod, our PioNears are in frequent contact with our product team: receiving early access to many new features, providing in-depth product feedback, engaging in user-testing, consulting on lesson and feature design, and more. This way our team makes sure hard data is always complemented with anecdotal evidence of how real teachers are using our product – ultimately helping us build more useful tools for teaching and learning. Further, we knew it was important to create channels and spaces for educators to collaborate with one another and share best practices from their own schools and classrooms. We started hosting an annual PioNear Summit where we fly in our ambassadors from around the world to meet under one roof, gain insight into the company pipeline and collaborate with one another. I have been blown away by the extent to which our ambassadors support each other: helping with upcoming workshops, filling in for one another in trainings, creating materials and best practices tips to share with each other, and more. The program needs to make sense for the ambassadors even more than it does for you and your company! Frame the program – and program offerings – in terms of value add for ambassadors, and align these offerings to business goals. Let your early ambassadors help shape the program. We took a user-centered design approach by asking our early educator advocates: How can we support you in what you are already doing? Are there additional opportunities that you would like to pursue as a Nearpod ambassador? We measured the success of these early community initiatives, and doubled down on those that generated a positive return for us and for our ambassadors. Before kicking off, be aware this is a long term investment (and not a minor one!) Cultivating a community of dedicated, tight-knit educators does not happen overnight. You need to start slowly, find your champions, be intentional about process, and be willing to wait for the long term payoff. It takes resources that you could be using elsewhere, and results are not obtained overnight. This may be an issue in the startup world, but it should not be a prohibitive one. Once you commit, you need to follow through or else the program can backfire. Educators will quickly realize if you are not backing up your program with genuine time, resources and thoughtfulness. Our program’s success depended on dedicated operational, strategic and financial resources. In building this network, it’s important to do much more than just introduce impressive educators to one another and share a digital badge. Align your ambassador investment to business goals early on, and build systems to track the program’s ROI. 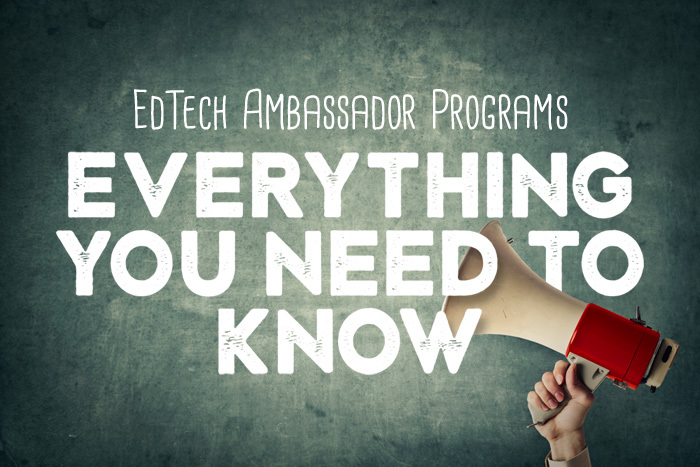 If you’re an educator thinking about getting involved with an ambassador program, but you aren’t quite sure where to start, here are a few suggestions from Josh Tappan, who has reviewed over 700 PioNear applications to date. Josh (@josh_nearpod) built our ambassador program from the ground-up, and you’re welcome to reach out to him if you have any questions about starting, growing, or engaging your teacher community. Get to know the product inside and out. The more experience you have using the tool in a live classroom, the better. We look for heavy product usage (number of lessons created and taught, and number of students engaged) as a first indicator of your qualifications. Start sharing effective teaching and learning strategies and tools with your peers. We look for educators who take the initiative to go outside of their role to promote effective instructional practices and technology tools. Specifically, we look for educators who are dedicated to helping their colleagues learn and grow: hosting trainings, modeling lessons, leading lunch workshops, working closely with the edtech director, going to conferences, etc. 100% of our ambassadors were already major Nearpod advocates in their schools and district before becoming formal ambassadors. Get comfortable as a facilitator. Strong communication skills are essential as an ambassador. We need to make sure that you can present confidently and connect with a range of educators from different grades, subjects and backgrounds. Leading a local workshop, organizing an edcamp or presenting at a conference is a great way to start. Your passion for edtech is rooted in a strong pedagogy. It is critical that you have a very clear understanding of the product and the ways in which it can be used to impact teaching and learning. It’s not about thinking an edtech product has the coolest features or the most buzz, it’s about experiencing how that tool can transform classrooms and help students learn more effectively. If you are planning to contribute to an ambassador program – be it as an entrepreneur or as an educator – my best advice is to join for the right reasons. Don’t be disingenuous in your efforts to connect. As an entrepreneur, you have to really care about the educators and the students. You can’t say you are trying to grow an educator community with the intent to simply grow your tool and make money. If that’s your end goal, then you shouldn’t be starting an ambassador program. You need to care about building up a network of educators, connecting them and making a difference in the classroom. This post was written for Getting Smart by Guido and the BlendED team. ← What are some unconventional fundraising tips for edtech startups?